It’s a live podcast extravaganza in the Common Grounds Coffeehouse! 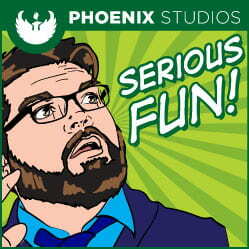 As part of Women’s History Month, the Phoenix Studios podcast “Serious Fun” will record its final episode in a three-episode series featuring all-female panels discussing gender issues and the female experience in popular culture. The event is Thursday, April 5 from 6 to 7 p.m. in the Common Grounds Coffeehouse. This podcast features “The Unsung Female Heroes of Popular Culture.” Join panelists Assistant Prof. Rebecca Nesvet (Humanities), Associate Prof. Michelle McQuade Dewhirst (Music) and Assistant Prof. Kristine Coulter (Democracy and Justice Studies) as they talk about women in the arts and popular culture who deserve more recognition, and what we can do to support women in these fields. For more, see the Phoenix Studios podcast network. This entry was posted in Announcements and tagged CAHSS, Communication, Democracy and Justice Studies, humanities, Music, Phoenix Studios, podcasts on April 5, 2018 by Sue Bodilly.